Where? 1hr from SW London, at a majestic private forest estate in Sussex. When? Arrive 0930hrs Saturday and depart 1300hrs Sunday: 13th-14th April, 15th-16th June & 7th-8th September 2019. Based at an expedition style camp in the heart of the forest, this will be a very practical weekend with a maximum group size of 10. You will be encouraged to have a go at a range of activities aimed to help us have fun while connecting with the wild. Around the campfire there will be time for tales of adventure, celebrating the day’s journey and of course marsh-mallows! 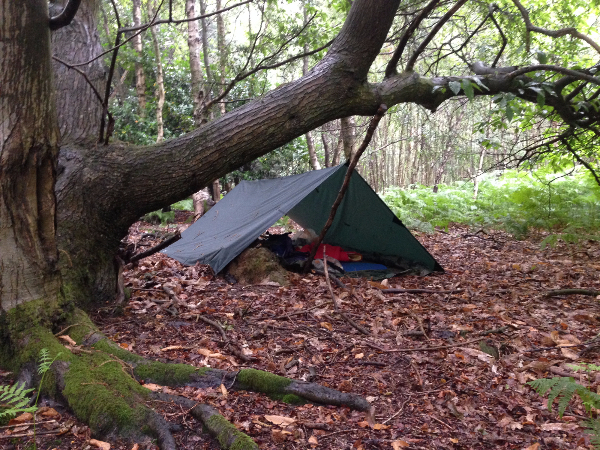 Accommodation will be under tarp bivouacs which you and your son will set up during the shelter session. All main meals, and tea / coffee / hot chocolate will be provided. Our evening meal on Saturday night will be a hearty game stew which we will prepare and cook over the campfire. On Sunday morning we will make damper bread for breakfast cooked on the embers. Hot water for beverages will be supplied via the camp kettle throughout the weekend. Like me you may be blessed with an equally adventurous wife and daughter who also thrive spending time in the forest. If so, have a look at my Dads & Daughters and, Wild Ventures Weekends. Here’s to woodsmoke, and winning the hearts of our boys! You may note the similarities between my events for Daughters and for Sons, and naturally ask why these are separate? I believe it is precious to intentionally spend Father & Son time, or Dad & Daughter time. It helps impart value to our kids and in my experience, relationships with sons and daughters have different dynamics, which we can cherish and enjoy!